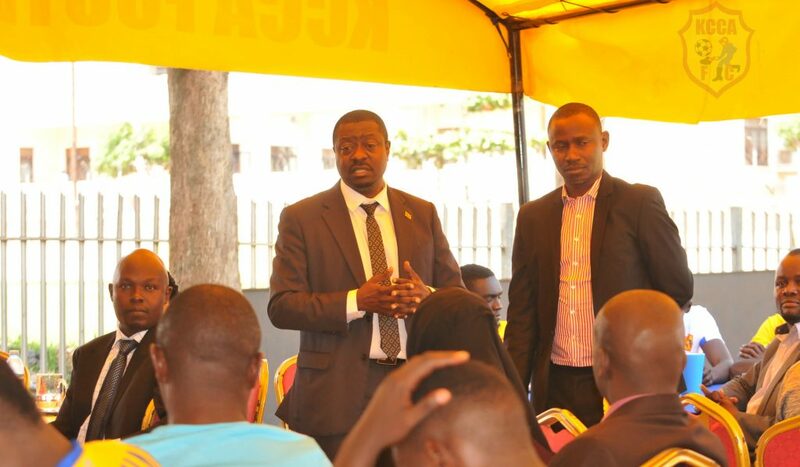 KCCA Executive Director Andrew Kitaka and KCCA FC Chairman Ashaba Aggrey at the event. Acting Executive Director of KCCA Andrew Kitaka paid a courtesy visit to KCCA FC for the first time. The Executive Director together with Juliet Namuddu the Director Education and Social Services at KCCA and club Board members; Aggrey Ashaba, George Opio, Davis Othieno, Tom Lwanga and Edgar Bwambale had lunch and later a meet and greet with the player. Allan Kyambadde pays attention during the event. Kitaka assured the club board members, management, technical team and players of full support from KCCA. As KCCA, we assure you of our full support and we will keep aiding the club to enable it hit greater heights. Our focus as the authority is to improve player welfare, improve current state of the stadium and ensure the club can host football games at night. KCCA Ag Executive Director and KCCA FC Ag Chairman share a light moment. The Executive Director also said he has been and is still keeping tabs on the club. He further told the players that it’s possible to eliminate AS Otoho in the CAF Confederation Cup this Sunday 20th January 2019, despite the first leg loss in Congo. Kitaka speaking to the players at the event. “You can turn the tie around” he said. “Come Sunday, believe in yourselves and have faith that you can overturn this result” he added.